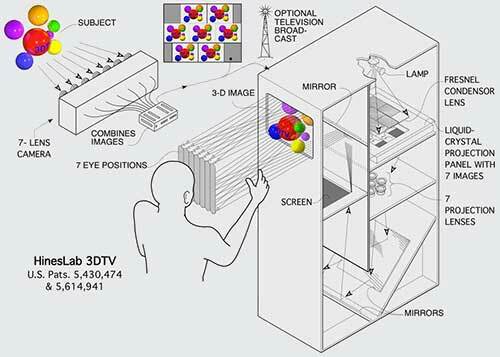 HinesLab announces the development of "3-D TV", a 3-dimensional auto-stereoscopic video display developed by Steve Hines. 3-D TV provides true stereoscopic images, without glasses. Several viewers can move comfortably in front of the display, seeing true stereo images with motion parallax. Applications include 3-D home television, 3-D video arcade games, 3-D video phones, computer workstations, scientific, medical, and avionic cockpit displays. Animated images used in 3DTV demonstrations at HinesLab. The HinesLab 3-D TV is built around a single liquid crystal panel, on which multiple images are arranged and projected to a rear-projection screen where they form the 3-D image. Stereo and motion parallax allow the viewer to confirm the positions and roundness of objects as the observer changes positions. No 3-D glasses, reflective dots or head-tracked devices are required. No glasses to become broken or lost. 3DTV provides from 3 to 21 eye positions, providing lateral head freedom and look-around ability, confirming the position and shape of objects. The user can sit comfortably in front of the monitor, with freedom to move within the viewing space. It is not possible to see pseudo-3D (reversed depth) images as with lenticular 3-D systems. The 3DTV signal can be broadcast by a single television station (NTSC, HDTV, etc.) over air ways or cable. 3DTV images can be displayed live, or recorded and replayed in 3-D with a single VCR. The device can be used as a computer display, with a single video board, for video arcade games, CAD workstations, scientific and medical visualization, and by air traffic controllers, etc. The 3DTV image can be projected to virtually any screen size and is not limited to the size of direct-view LCD's, nor is the illumination limited to the low light levels of CRT systems. The 3DTV projects all images simultaneously, in full color, and creates no flicker. HinesLab autostereoscopic 3-D TV does not require the user to wear reflective dots, or use a head-tracking technique which moves internal optics, limiting use to a single viewer. The 3-D TV display can be produced economically because it uses a single LC panel and conventional optics. During product development, the OEM company can choose from several cost-vs.-resolution levels of technology (creating 3, 4, 7, 13 or 21 eye positions), and a range of viewing angles, limited only by available liquid-crystal technology. The 3 and 4-image versions provide higher resolution. The 13 and 21-image versions provide more viewing positions. HinesLab is now offering licenses for this patented technology to OEM companies interested in enhancing their line of arcade games, computer and avionic displays, and home televisions. This is not a product for sale to end users. Manufacturers are invited to visit HinesLab for a demonstration of a 20"-screen 3-D TV arcade game shown below, and to discuss licensing options. Journal of the Society for Information Display, Vol. 8, No. 2, 2000, p. 171 & 176. "Autostereoscopic video display with motion parallax" Journal of the Society for Information Display, Vol. 7, No. 3, 1999, p. 187-192. The Clock magazine, Mar./April 1997, p. 17, 20 & 27. Stereo World magazine, Jan/Feb, 1996, p. 12-15. Popular Science magazine, Jan. 1996, p. 25. Electronic Display World, Vol, 15, No. 11, Nov. 1995, p. 38-41. Electronic Engineering Times, Oct. 2, 1995, p. 2, 35, 38 & 40. Stereo World magazine, Jul/Aug, 1995, p. 25. Hines' original laboratory notebook entries for this invention. This is a technology announcement and license offer, not a product being offered for sale to end users. Display manufacturers are invited to contact Steve Hines to arrange a demonstration or to discuss a manufacturing and sales license.